London – Thursday 16th July 2015 – A mouth watering domestic clash, between Newport’s Lee Churcher and Edinburgh’s Craig McEwan, is set to feature on the undercard of the upcoming Thomas Melville’s Colloseum Promotions THE COMEBACK event at the Lagoon Leisure Centre in Paisley, Scotland on Saturday 15th August 2015, which is headlined by the Craig Docherty-Michael Kelly WBU World Super Welterweight Championship showdown. Churcher (12-3-1), who secured the BBBofC Welsh area title with a ninth round stoppage victory over Barrie Jones in 2012, but never got to defend it before switching allegiance to the MBC, comes into the fight off a six win streak. His opponent, McEwan (22-4-1) will be making his first home appearance since returning from America, where he fought amongst others World Champions Andy Lee and Peter Quillin. On paper the bout looks set to be a stormer as both protagonists are very much ‘attack is the best form of defense’ minded, so much so that a number of on-line pundits have mooted that this is likely to be an out and out toe-to-toe war, very much in a similar vain to those classic battles between Arturo Gatti and Mickey Ward back in 2002/3. A train of thought that virtually mirrors Churcher’s own, as was made clear when he spoke earlier. “This is a massive fight for me, I’m really looking forward to fighting him, he’s tough and a big puncher, much like me really. These are the type of fights real fighters want, challenging to put it mildly, fights like this are made for the big occasion and they don’t get much bigger than this, well in Scotland that’s for sure, there’s the Craig Docherty-Michael Kelly title fight headlining and Scott Harrison will be making his return on the show too. That said, I think it will be our fight the fans will talk about most, especially afterwards, It’s going to be a war in there. Yeah he’s been in with some good names, but that doesn’t worry me, it’s not an option for me, I can’t lose, it’s as simple as that. I’m going to take the fight to him, have to really, his right hand delivers a devastating blow, so mustn’t give him the room to use it, I’ve got to get in there and give it to him first. I’m not worried about the occasion or that it’s on his home turf, OK so I’m likely to receive a hostile reception, but that’s fine with me. 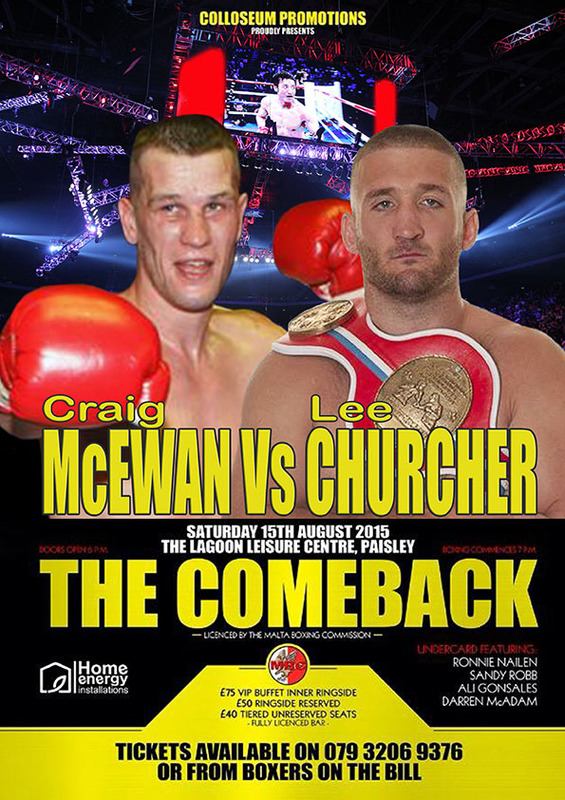 Lee Churcher vs Craig McEwan features on the undercard of the Craig Docherty-Michael Kelly World Boxing Union (WBU) Super Welterweight World Championship bout that headlines the Thomas Melville’s Colloseum Promotions THE COMEBACK event at the Lagoon Leisure Centre in Paisley, Scotland on Saturday 15th August 2015.